I am modeling flooding along a stream that enters a long culvert under a parking lot in SRH-2D. During high flows the culvert overtops and pools in the parking lot before draining off in a different direction. The problem is that the 1D overtopping flow of the culvert acts like a wall through the parking lot. The water that overtops to the left side of the culvert is blocked by the 1D section from reaching the outlet and just pools and swirls. The blockage raises the water surface on that side of the culvert about a tenth of foot above the other side. You are right, the elements between the culvert faces are disabled and act as a barrier to flow. Another option for you would be to instead use a "Link" type structure which would not disable elements between the faces of the structure. Within the Link setup parameters you can specify a rating curve as the inflow type. 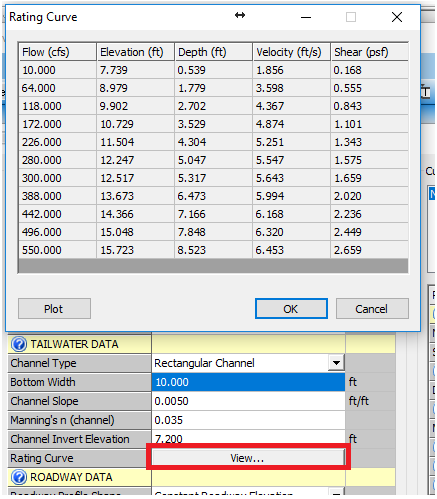 Outside of SMS, if you open the HY8 file within the HY8 program and then go to the crossing properties, there is an option to view the rating curve data if you supply the discharge and tailwater data to the crossing definition. This method can work well as long as you can reasonably represent the hydraulic conditions around the culvert with a simple rating curve. An example of where this method would not work well is if the hydraulic conditions were tidally controlled. Thanks you for the reply. 2D pressure flow areas would have the same problem as 1D culverts, right? 2D pressure flow areas are actually different than culverts by nature. They actually don't deactivate the elements between the structure faces but rather act as a ceiling through which water can pass under, all the while keeping the 2D computations continuous while adding pressure flow computations to the region. There is an optional 1D component to the 2D pressure flow structures for computing overtopping which uses weir equations. This 1D component will not deactivate elements through the structure. 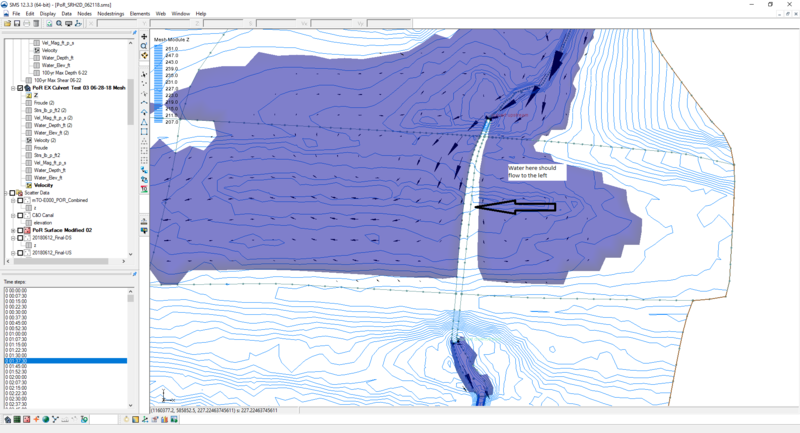 Do the elements in the 2D pressure flow area represent the channel under the bridge or the bridge deck? The elevations of the 2D elements should represent the elevation of the channel beneath the bridge deck. The parameters specified in the structure will define the deck low/high chord elevations. Anything on overtopping the deck is model as 1D flow between the end boundaries. I think I am thinking of a 3D situation with flows going two different directions on top of each other. I am going to use the links as you suggested. They should be good enough for this model. You are right, the 1D overtopping as well as the computed 2D pressure flows would be for all flow traveling in the direction of the culvert flows. Your parking lot flow traveling perpendicular to the structure would not be represented how you would want it to be with a pressure flow structure.